To prepare tomato jam, place tomatoes, honey, 3 tablespoons lemon juice, tomato paste, cider vinegar, garlic, salt, oregano, cumin, black pepper, and red pepper flakes in a large saucepan. Heat over medium-high heat until mixture boils. Reduce heat to medium-low and simmer, stirring occasionally, until mixture reduces and thickens to a jam-like consistency, about 60 to 75 minutes. Remove from heat and cool completely. Preheat oven to 425 degrees and place a rack in the center. In a large saucepan, place olive oil and heat over medium heat. Add garlic and cook, stirring frequently, until light golden, about 3 to 4 minutes. Add wine, remaining 1/4 cup lemon juice, and 1/2 cup tomato jam and stir well. Simmer tomato mixture until slightly reduced and thickened, about 6 to 8 minutes. Remove pan from heat and stir in thyme leaves and olives. Coat the bottom of a ceramic baking dish large enough to hold the fish with a thin film of olive oil. Season fillets on both sides with salt and pepper. 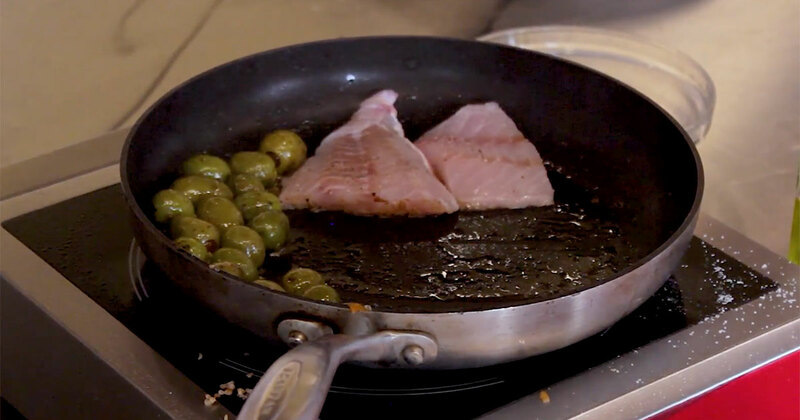 Place fish in the prepared pan and cover with tomato mixture. Cover baking dish and place in preheated oven. Roast until fish just begins to flake, about 12 to 15 minutes. To serve, transfer fish using a fish spatula to individual shallow serving bowls. Spoon about 4 to 6 ounces of tomato mixture on and around fish. Top with tomato jam and sprinkle with feta cheese. Serve immediately.